An-Nasir Salah ad-Din Yusuf ibn Ayyub, known as Salah ad-Din or Saladin, was the first sultan of Egypt and Syria and the founder of the Ayyubid dynasty. 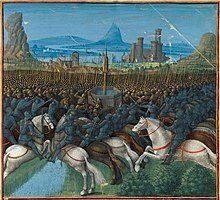 A Sunni Muslim of Kurdish ethnicity, Saladin led the Muslim military campaign against the Crusader states in the Levant. At the height of his power, his sultanate included Egypt, Syria, Upper Mesopotamia, the Hejaz, Yemen and other parts of North Africa. Al-Kamil was a Kurdish ruler, the fourth Ayyubid sultan of Egypt. During his tenure as sultan, the Ayyubids defeated the Fifth Crusade. He was known to the Frankish crusaders as Meledin, a name by which he is still referred to in some older western sources. As a result of the Sixth Crusade, he ceded Jerusalem to the Christians and is known to have met with Saint Francis. 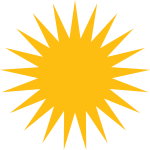 Asad ad-Dīn Shīrkūh bin Shādhī, also known as Shirkuh, Shêrkoh, or Shêrko was a Kurdish military commander, and uncle of Saladin. His military and diplomatic efforts in Egypt were a key factor in establishing the Ayyubid family in that country.